The black cat with the cut-off tail does not only stand for the town of Gabrovo as its emblem; it watches over the time-worn practices of the local sober-minded population to be prudent with money and to observe saving as a "social norm" as well. She is the "queen" of the Gabrovo carnival, and it is in her honour that the House of Humour and Satire has set a special place for two pieces of feline sculpture reveered by all museum visitors. The first cat was sculpted by Bulgarian artist MIHAIL BENCHEV in 1979 in strict line with the Gabrovo principle " to make something out of nothin g", for it was made of the cheapest possible and most durable material at the time - 300 kg of nails and wire. The cat's tail is not docked off, as no Gabrovian would ever waste a pair of scissors on an iron tail, but if you make a wish and touch the cat, the cat will make your wish a fact! 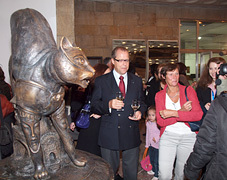 A much younger sibling of Benchev's cat was donated to the House in 2010 to mark the museum's 38th birthday and the 150 years since Gabrovo was proclaimed a town. The generous donors are GEORGI BALABANOV, a Gabrovo sculptor who authored the work, and Dr. TODOR SHANDURKOV - two local patriots who firmly believe in the undying power of local traditions. Since the second cat came into the world under entirely different economic circumstances, "when she hears the jingle of a coin, she readily makes your happiness threefold". You won't miss the chance, would you?